Traveling through Guatemala was an unexpected pleasure; I traveled to Central America with the vague idea I would travel south from Mexico and stop in every country for a few weeks,a month if I loved a place. And then I crossed the border into Guatemala and instantly fell a bit in love. 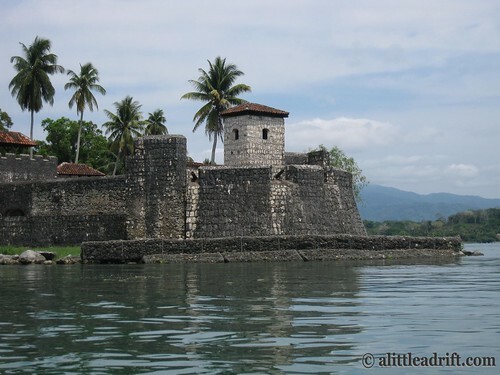 Over the succeeding three months, I would travel through major touristy spots like Tikal, Pacaya, and Lake Atitlán, Antigua, and into Western Highlands to study Spanish at a language school in Xela, or float on a boat down the Rio Dulce. 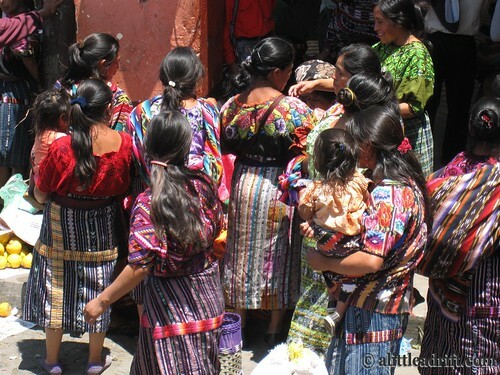 I loved the cadence of life in Guatemala, the openness the people, and the colorful Guatemalan textiles—people walking around with a riot of colors on their woven shirts and skirts. I love the layers in this photo; warm light as the sun sets, a modern radio antenna and bright yellow church among the ruins and dilapidated buildings. She was eager to show off her functioning stove and welcomed our requests to snap a few photos –she was proud. 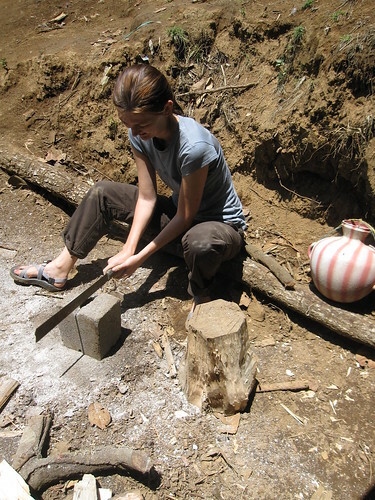 I was one of several volunteers who had hiked to a rural town outside of Xela, Guatemala to help with a stove building project in the region. These young Guatemalan children paddling around the lily pads on the Rio Dulce (Sweet River, in Spanish) came at a perfect time on my four hour boat ride down the Rio Dulce. 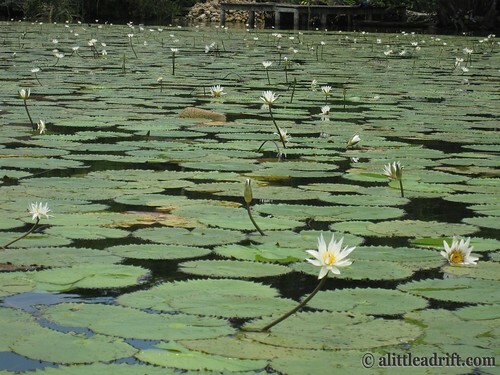 The thing is, I was so frustrated just minutes before I spotted them paddling amongst the lily pads down a side snake of water off the main river. Our guide was being tight lipped about why our boat was stopping every 20 minutes down to a putter, but I had a sneaking suspicion the boat was broken. And yet he wouldn’t tell us why; he just pretended it was natural for the engine to sputter down to an overheated, albeit temporary, death every 20 minutes. He’d take that time to point out local birds, a white heron gliding over the water and landing in nearby brush. But I wasn’t seeing any of that; instead I was agitated and wondering how long it was actually going to take to reach Livingston. Then I spotted these children. 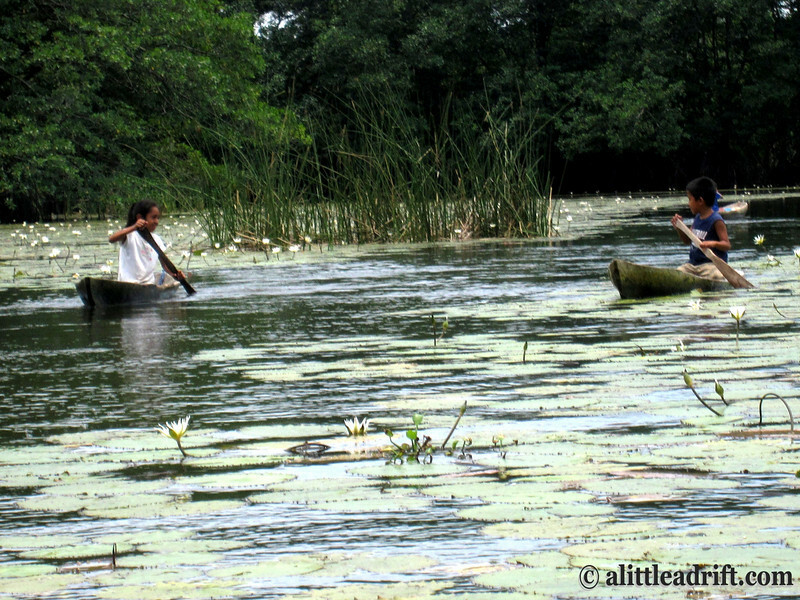 At peace in their surroundings and lost in the moment of their own games; their boats sliced through the blossoming lily pads and their giggle floated over the rippling water. And I realized I was missing the point of the Rio Dulce if I spent the entire boat ride up the river caught up in my pending destination. 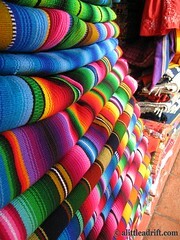 Antigua is a directly on the tourist path; in fact, it’s a veritable hub of tourist activity in Guatemala. It’s also pretty swell. It’s an adorably livable city for a traveler in need of a break; these kiddos are in simply rapt attention of a street mime. I just loved the their five figures sitting so close and friendly—body language doesn’t lie and that kid in the orange shirt is intrigued! A group gathers to watch a street mime on the cobblestone streets of Antigua, Guatemala. The great thing about a mime on foreign streets—you understand everything that’s happening no matter which language you speak. This was a moment just after the long Semana Santa holidays in the country and there were still plenty of tourists and locals alike on the streets of Antigua, but without the fervor of preparing for Easter Sunday. I ended up staying in Antigua for longer than I had planned precisely because of moments like this one—the city has pockets of art, culture, and conversation that took me by surprise. Even though it’s a tiny city in comparison to Xela or Guate City, there is a charm in Antigua that permeates. Whenever I needed to find some activities or something interesting, I headed to the town square area for the hum of people. The other lovely thing about Antigua? The city has volcano views from nearly every street. It’s a photogenic city on the whole, made even moreso with unexpected encounters with cute kids and street mimes! I almost overlooked Guatemala’s sweetest little river; running through the south and emptying into the Caribbean Sea the Rio Dulce is actually incredibly beautiful and reminiscent of the swampy waters of the Everglades in Florida (my home-state for inquiring minds). Thankfully these rivers are void of the pesky American Alligator and instead perfectly tranquil to better ensure several days of relaxing dockside and canoeing myself around the narrow canals shooting off of the river like tree branches from a tree trunk. 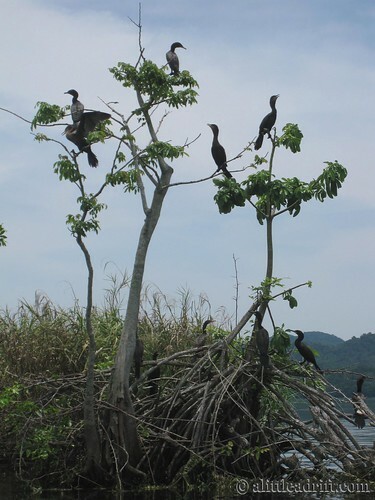 I really resisted my first few days relaxing on the Rio Dulce – I was behind in work and pre-research of my upcoming hostel promised free wifi (the Holy Grail for a freelancer). I was primed and ready to surrender several days of my travels to really plow through some work and play catch-up. And then the woes (and often needed obstacles) of backpacking life intervened – all of the remote houses on this part of the lake were undergoing repairs on the main power lines every day from 8am until roughly 8pm. No power means just a few precious hours of laptop battery and zero hours of internet time during the day. So I pouted to myself. And I whined a little in my head. And then I surrendered, plunked myself down on the couch in the communal deck/lounge area at my riverside hostel and quickly found myself drawn to a nearby group of three women backpackers (all friends) planning a trip to a nearby waterfall. Surrendering to the fact that my planned days of productivity were now negated I decided might as well explore the area–and traveling solo and all meant I latched on like an attention-starved puppy to the friendly group planning their waterfall trip for the next morning. Finca el Paraiso is a volcanic hot springs fed waterfall and was my reward for taking a needed break. The incredibly hot waterfall flows into an icy cold river flowing perpendicular to the waterfall creating a bizarre experience of chilly river water, patches of pee-warm water (sorry for the image, but it’s true!) and truly burn-you-hot bursts of waterfall. It took exploring but we did manage to find a cozy warm spot just next to the steaming falls relax and breathe in the clean air. Our guide shared a locals tip with us we would have never tried on our own – if you are willing to dive under the low rock wall of the waterfall a little nook hides big enough for all four of us. First thought? No. Not happening, I’ll drown. But it sounded so appealing and group m entality won out so a quick (and incredibly shallow dive to be honest) put us right under a rock lip that had rushing sulfur water flowing down and thus created the perfect sulfur sauna. It was actually incredible! Our guide was spot-on and we cleared our lungs and skin in the natural sauna for nearly an hour, ducking into the cold river water when the steam became oppressive (and sometimes it was the smell to be honest). After surrendering to the experience and over the following days I spent several low-key and lovely afternoons embracing my forced technology-free days, what a rare treat! The bright colors of Guatemala take their palette from a kindergarten classroom, or perhaps from the toucans and macaws that inhabit the country’s forests. The brilliant reds mix with saffrons made of liquid sunshine and blues right out of the darkest depths of the ocean. 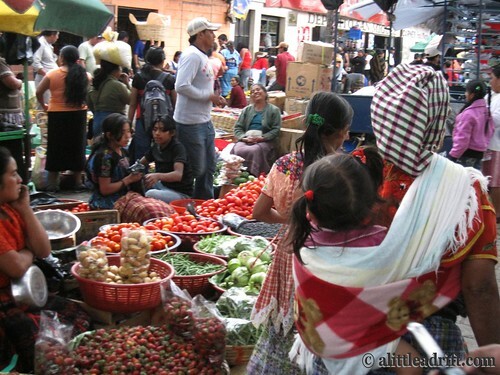 I’ve milked just about story possible out of Guatemala except for the markets. I love markets all over the world and until Guatemala India held the top spot in my heart; now the two countries compete for the honor of most diverse and brilliant hued marketplaces. Rosie didn’t do Chichicastenango justice when she sarcastically mentioned this now iconic Central American market in Bye Bye Birdie (any other musical nerds? anyone? Bueller? 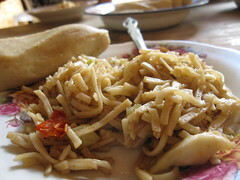 ), but Chichi market place is certainly deserving of a both a song and half a day. Held every single Thursday and Sunday villagers from all over the Western Highlands in Guatemala bring their wares and textiles to flesh out the permanent stalls in this medium size town that swells in size on market days. 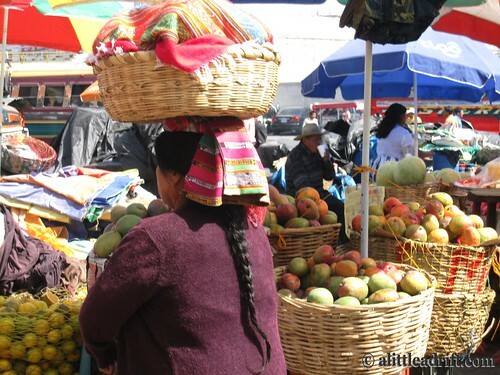 I actually have mixed feelings about Chichi, another traveler referred to it as the Walmart of Guatemala – a name both a funny and apt. The experience was neat but I would actually skip it if I were traveling on a tight time line…but that’s just me, other travelers fell in love! As far as market’s go the Artisan’s market in Antigua was my favorite place to actually to pick up some trinkets and presents for the kids in my life back home. 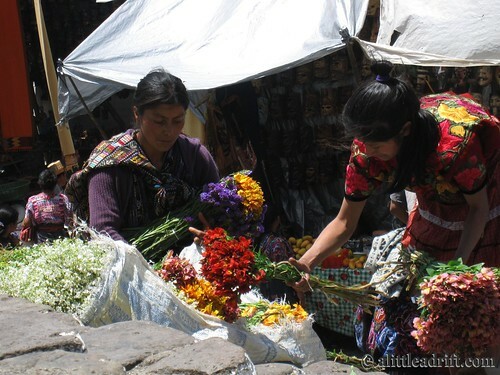 The vendors pay a pretty penny to locate themselves within the Artisan’s market which results in a higher end selection of goods in most cases. 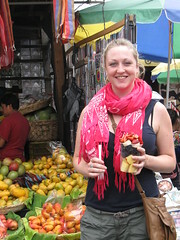 Additionally, and it cannot be overrated, just outside of the Artisan’s Market is Antigua’s local market for fresh fruit and veggies. 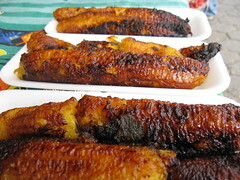 A mere 5Q (about 60 cents) yields a heaping cup full of fresh fruit and when I parted with another 5Q a nearby stall handed over a plate full of freshly grilled plantain –does lunch get much better than that?! Friends in LA once I got there last month informed me that this purse is actually really tacky. 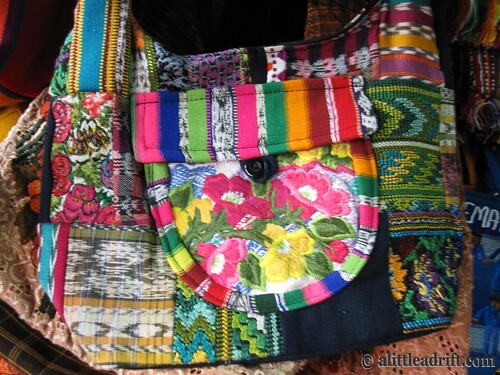 It sends me straight back to Guatemalan every time I look at it though! What do you think? Tacky or gorgeous?! Nestled into the cozy, cushioned table beds in Café D’Noz on Lago de Atitlán I was taken off guard when my server climbed up onto the cushions to whisper in my ear. At first all I heard was a bit of hushed syllables inaudible over the blaring movie showing in the café. With a questioning look from me she repeated the sentence in a hurried voice and rapidly stilting English. 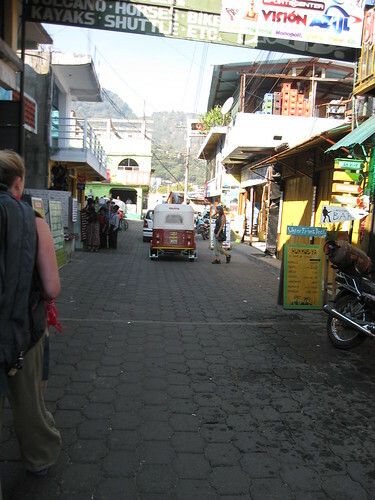 San Pedro on Lake Atitlán is a really big party town; the tiny town is full of backpackers and has a lot of English speaking ex-pats running trendy little bars. It’s far from the quietest spot on the lake and was only going to be an overnight spot for me before heading a bit up the road to San Marcos for a couple of weeks of relaxing on the lake. 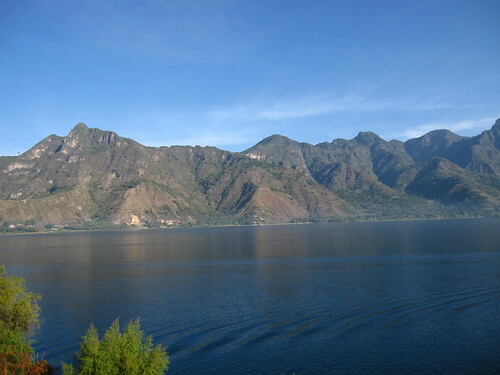 Because despite the drug raid in progress, which would taint my experience on the beautiful Lago de Atitlán, this area is one of the prettiest spots in all of Guatemala. After our server moved on to the next table to quickly spread the message, my friends and I were torn – do we stay and finish watching the movie or just go home to avoid any interaction with the police? None of us had drugs so we figured we were safe to watch the last 20 minutes before heading back to the hostel. Those 20 minutes probably saved me from spending the night in Guatemalan jail. The police never showed up to our café so we walked straight back to our hostel, warning a group of travelers in the process about the current raid rumors before parting ways and going straight to bed. About four hours later, in the dead of night, an incessant and soft knock woke me up. Earlier in the day I briefly met the woman sharing my hostel room and the woman now knocking at the door was not my friendly British co-habitant. In rapid Spanish she asked me to help me find my roommate’s passport as fast as possible – my roomie had gotten put in jail as a part of a street sweep (right at the time I was finishing my movie) and was trying to get out in time to catch her flight back to the UK later that day. I helped. My roomie paid her way out just in time to run back to the hostel, grab her pack, cry a little, and then catch the shuttle heading to Guate City. The rest of the day the entire town was buzzing about the backpackers still left in jail; two young male backpackers (with zero knowledge of Spanish) had actually spent the night cuffed wrist to ankle waiting for release. Through all of this, I have no idea the drugs the police actually found on the travelers they arrested. What I do know is that roughly 40 backpackers got put in jail for not having their passports on them. And what I find particularly interesting is the way this story evolved in the two months I spent in Central America after the drug raids (which were condemned by the Guatemalan police later that week once the embassies got involved and the San Pedro police were told to stop arresting backpackers for the passport issue). ALWAYS carry at least a photocopy of your passport on you. Apparently it’s illegal in a lot of countries to walk around without identification. Who knew?! Tearfully calling my dad for help out of a developing world jail (or any jail for that matter) is not high on my bucket list so I’ll stick to a country’s legal activities. 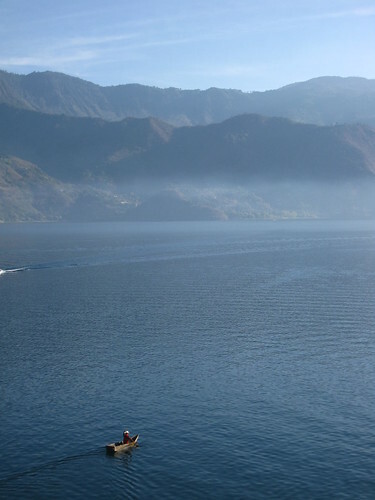 Oh, and in case you couldn’t tell, beyond all of this drug raid story, Lake Atitlán is actually pretty gorgeous and worth a visit! One full hour after starting our project we finally had the first layer of concrete blocks nestled next to each other, absolutely perfectly level and arranged in a large rectangular shape. 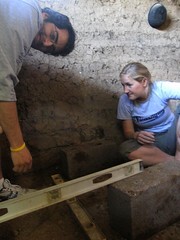 Mitul and Grace, also volunteers from the Pop Wuj language school in Guatemala, carefully scrapped at the wet red clay while I was nearby hefting up each and every concrete block into tubs of pond water, allowing each block to soak for 10 minutes before taking it to Mitul and Grace. 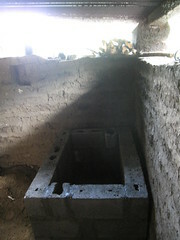 These concrete blocks were the first step toward creating an estufa, or stove, for a small and growing family in rural Guatemala. This is one of the most instantly rewarding volunteer projects that I’ve worked on because I was right there with the family and creating something within just one week that they desperately need. 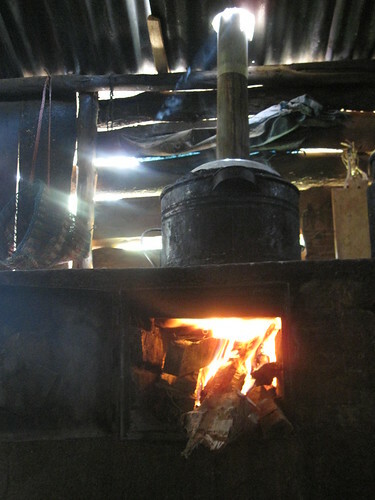 The indigenous Mayans in rural areas of Guatemala often use small cook fires right inside their homes – these open fires stay lit and smoke up the house nearly all day and into the night. They are used for food, a source of light, and even heat. They’re also dangerous for the children and can cause severe respiration problems for the women and children who are so often inside of the home for long periods of time. Oh yes, that's me weilding a machete to cut a brick in half! 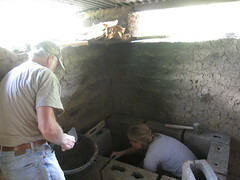 The base of the stove is used for height and to diffuse the heat – and it’s imperative that the base layer of bricks are level or else you spend the next four hours attempting to level other layers using cement compound under and around the bricks…the other group skipped the leveling process and had to strip down hours of work and start over! The stoves were built in two stages – I was only able to help with Stage One stoves, the base, but the volunteer coordinator hiked with me over to a nearby village to see the finished stoves in action – the families were very proud to show off their stoves. The entire project is incredibly rewarding and the families receiving our new estufa watched the building process with cautious excitement, the lunch photo was a simple but delicious lunch with an unlimited supply of tamales!